Chemistry professor Huw Davies, who holds 23 patents and has published 280 scientific articles, is focused on the design of new catalysts to enable synthetic technologies for drug discovery. Emory Photo/Video. Huw Davies, Asa Griggs Candler Professor of Organic Chemistry at Emory University, has been named a fellow of the National Academy of Inventors (NAI). Election to NAI fellow status is a high professional distinction accorded to academic inventors who have demonstrated a prolific spirit of innovation in creating or facilitating outstanding inventions that have made a tangible impact on quality of life, economic development and the welfare of society. 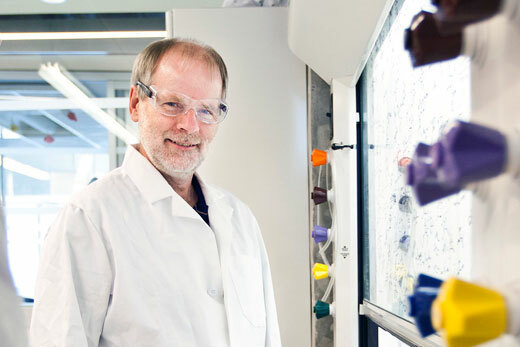 Davies, who holds 23 patents and has published 280 scientific articles, is focused on the design of new catalysts to enable synthetic technologies for drug discovery. He is director of the Center for C-H Functionalization (CCHF), funded by the National Science Foundation. The center, headquartered at Emory, is pioneering a paradigm shift on how organic chemicals are made by bringing together the expertise of a wide range of chemists at 19 top research universities from across the United States, as well as in Asia and Europe. Davies is also a fellow of the Royal Society of Chemistry, the American Chemical Society and the American Association for the Advancement of Science. His many awards include the American Chemical Society Cope Scholar Award, the EROS Best Reagent Award and second place for the Niagara Frontier Inventor of the Year Award (Physical Sciences). Davies joined Emory’s Department of Chemistry in 2008 and also serves as the director of Graduate Studies. The NAI fellows named today bring the total number to 414, representing more than 150 prestigious research universities and governmental and non-profit research institutions. Included among all of the NAI fellows are 208 members of the other National Academies, 21 inductees of the National Inventors Hall of Fame, 16 recipients of the U.S. National Medal of Science and 21 Nobel Laureates, among other awards and distinctions. The NAI fellows will be inducted by the Deputy U.S. Commissioner for Patent Operations, from the United States Patent and Trademark Office, during the annual conference of the National Academy of Inventors in March. The academic inventors and innovators elected to the rank of NAI fellow are named inventors on U.S. patents and were nominated by their peers for outstanding contributions to innovation in areas such as patents and licensing, innovative discovery and technology, significant impact on society, and support and enhancement of innovation.